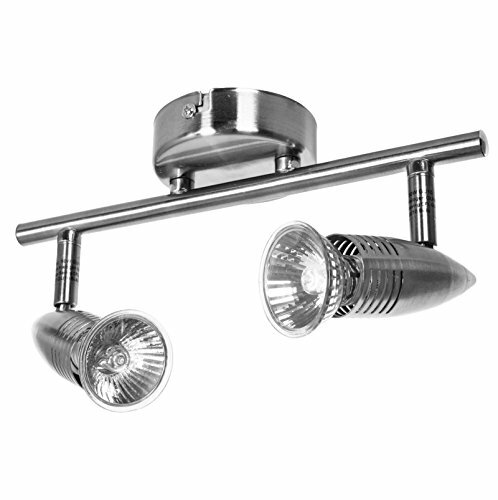 Choice of 1, 2, 3, 4 or 6 way bar spotlight or 3 way spiral fitting. Choice of brushed steel or chrome metal finish. Good quality (all metal) construction. Very easy to fit and very attractive. Designed to look good and stay looking good. Can be used with normal on and off switches using any bulb or can be used with dimmer switches as long as the bulbs used are dimmable bulbs. Adjustable up, down and swivel heads so you can point the lights in any direction so in kitchens you can point the light towards your work surfaces and in bathrooms you can point them towards your sink or mirror etc. Standard 220v to 240v UK and European voltage. Ideal for replacing older light fittings for a more up to date look and effect. It is just 2 screws for the separate steel mount to attach it to the ceiling then you simply connect the wires to the screw terminals and then fit the fitting onto the mount. CE safety approved and RoHS safety compliant. Indoor use only. Can be used in kitchens, halls, living rooms, bedrooms, dining rooms, games rooms they can also be used in bathrooms but not in the zone 1 & 2 wet areas. (for instance directly over or in the shower or bath). A great buy and an inexpensive way of improving the look of any room. Product dimensions are 275 x 100 x 130mm. Mounting plate length is 85mm.